We know that IT plays a big role in reaching your small- and medium-sized business (SMB) milestones. When it comes to hardware, you don’t need to be an IT expert to find the best possible solution. Here's a concise and helpful guide to the best hardware for your SMB. A growing company really needs a combination of both types of computers. However, a desktop computer will be generally more reliable for the fledgeling company owner. Laptops should be added as budget permits to provide that extra portability and convenience, especially for managers who work remotely. All the above points are subjective but the most important thing your laptop needs to be is personal. At ATG the specs are tailored to you. We like Lenovo but we don’t discriminate. 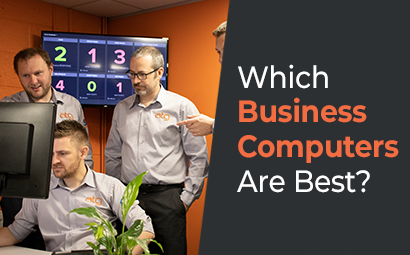 Their laptops are reliable, accessible and great for employees to work with standard applications. But say you’re a web developer? You might need a laptop with design software and perhaps enough storage space for those large applications. We'd be happy to recommend the best solution according to your company's business needs and objectives, get in touch!